The media and some professional blogs are spreading the view that the European debt crisis is caused by the decision of the political authorities of the countries under attack to let their citizens live beyond the material possibilities of the economy. They advertise the unfounded fears that the taxpayer of the other euro-countries is becoming the victim of a money machine that rewards the profligacy of Southern European countries. As shown in our PERI paper The debt crisis and the ECB’s role of lender of last resort, these fears have become powerful political forces inhibiting rational solutions. When the crisis began in April-May 2010, the Greek sovereign debt was around 300 billion euros and it was sufficient to buy a portion of it to persuade the markets that the authorities were determined to stabilise the interest rates. Yet, in spite of its independence, the ECB waited the end of the regional elections of May 9 in Renania-Westfalia (Germany) to respond to the speculative attacks, which had gambled on the view that the European authorities would not react until the election had ended. On May 10 the ECB announced the start of the Securities Market Programme (SMP), envisaging the purchase of Government securities to restore the working of the transmission mechanism of monetary policy. Securities were bought from financial institutions and the payments were settled in their accounts with the Eurosystem. To avoid the risks of inflation and of losses on the value of the assets, the Programme established that the liquidity injected was sterilised and the securities were bought on a held-to-maturity basis. In spite of these precautions, there was opposition to the SMP within the Governing Council of the ECB. Some components criticised it in their national newspapers and even resigned from their positions. These behaviours, which violate the principles inspiring the organisation of the Eurosystem, have weakened the ECB’s interventions and further enhanced speculation. The SMP purchased sovereign bonds from May to December 2010. It resumed activity in August 2011, after the Council of the Heads of State or Government of the European Union brought in its Decision of July 21 the declarations of several political leaders in favour of an agreement between the Greek Government and the private sector on a partial reduction of the face value of sovereign bonds. The ECB had opposed this solution fearing the negative effects of a debt restructuring on the management of sovereign debts and on the working of the interbank markets. Its concerns were right. By the end of July, speculative attacks further raised the interest rates and involved in the crisis Spain and Italy. The interbank loans to their financial institutions shrank and the Eurosystem had to fill in the gap through its TARGET payment system. 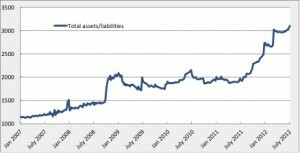 As a consequence, liquidity provision and the Eurosystem’s stock of assets and liabilities rose as sharply as after the failure of the Lehman Brothers (see Figure 1). Within the TARGET system the ECB acts as a clearing-house. Whenever central bank money moves within TARGET from one country to another, the transferring central bank records in its balance sheet a liability to the ECB equal to the reduction of another liability (the deposit held by the commercial bank making the payment). The recipient central bank instead records in its balance a claim on the ECB equal to the increase in the deposit held by the commercial bank receiving the payment. When the interbank markets cease to function, these “TARGET balances” increase. According to some authors (e.g. Sinn), the rise in TARGET balances brings about higher risks for the taxpayer of creditor countries. The rise is caused by the decision of the Governments of debtor countries to let their citizens live beyond the possibilities of the economy. This choice generates unsustainable current account deficits and loss of confidence in the public finances and in the banking systems. Other authors (e.g. De Grauwe) oppose this position. Their econometric analyses show that the increase in TARGET balances are related to speculative capital movements, rather than to the current account deficits of debtor countries. The capital movements are triggered by the spread of unfounded fears about the working of the monetary union and by the conflicts within the ECB, weakening its interventions. What’s more, this literature rejects the use of TARGET claims as a measure of the additional risks incurred by the taxpayer. When the interbank markets cease to function TARGET balances replace those of private financial institutions. Yet, there are no additional risks for the taxpayer of creditor countries because the risks previously assumed by their private banks for loans to private banks of debtor countries are now taken by the National Central Banks for claims on the ECB and the probability that the creditor countries must intervene to rescue the ECB cannot be considered higher than the probability that they have to intervene to rescue private banks. On September 6, 2012, the ECB decided to replace a new Programme, named Outright Monetary Transactions for the SMP. The Programme foresees that the ECB has full discretion in deciding its activation, continuation and suspension, that the liquidity created through the purchases of securities are sterilised, that securities are bought on a held-to-maturity basis and are issued by Governments respecting the conditionality imposed by the European authorities. In an interview to the Neue Zürcher Zeitung, published on September 26, Weidmann, President of the Bundesbank and the only member of the ECB to vote against the new Programme, explains the reasons of his opposition. He states that the Programme helps debtor countries to avoid market discipline and ‘spreads liability risk among euro-area taxpayers’. Thus, although outstanding literature turns down this position, Weidmann suggests that the TARGET balances introduce additional risks for the taxpayer of creditor countries. By doing so, he contributes to propagating fears that favour speculative movements and make it difficult for the authorities to apply rational solutions to the crisis. This analysis of the Eurosystem’s interventions suggests that the existence of conflicts within its governing bodies has favoured speculation. The media consider instead the misuse of public finances the main cause of the crisis and propose austerity policies, which are proving disastrous. As Domar’s equality indicates, fiscal policy enhancing growth and the central bank’s interventions reducing the interest rates are instead needed. This policy requires solving the moral hazard problem regarding the behaviour of the national authorities within the Eurozone. The literature has already indicated viable solutions to this problem, but the fears spread by the media make it difficult to introduce them. The authors are Professors at Università di Napoli Federico II, Dipartimento di Giurisprudenza.